Vumbura Plains Camp is situated to the east of Duba Plains in the neighboring northern concession area of the Okavango Delta. It borders onto the Moremi Reserve. Vumbura Plains can offer both water and land activities as this area has scenic waterways and is also close to the Okavango's outermost dry sandveld and open savannas. Vumbura Plains has 8 large tented rooms sleeping a maximum of 16 guests. Each room has a hot and cold shower and flush toilets en-suite. The rooms are tastefully decorated and give Vumbura guests a wonderful feeling of being out in remote Africa - while still being comfortable. The water levels around the camp change each year depending on the level of the annual floods from central Africa. The privacy of this area is one of Vumbura's main attractions - with a great all round Okavango Experience. The main dining, lounge and pub area is tucked beneath a canopy of indigenous trees with a superb view across the floodplain. The camp also has a plunge pool. Vumbura Plains offers mokoro (dugout canoe) excursions. walks, boating and game drives in open 4x4 vehicles, accompanied by experienced guides. Vumbura has both the wetland and savannah species of wildlife - Red Lechwe, Waterbuck, Hippos, Crocodiles as well as Sable, Kudu, Wildebeest and Tsessebe which roam the open plains. Herds of Buffalo and Elephant occur here, along with the predators - Lion, Leopard, Wild Dog and Cheetah. Guests who enjoy their birding will love the combination of all the Okavango water "specials" as well as acacia and mopane species in the dry woodlands. Duba Plains, Vumbura Plains and Little Vumbura are Wilderness Safaris camps that fall into two concessions totaling over 89 000 hectares (220 000 acres) that have been ceded by the Botswana Government to five villages just outside of the Okavango Delta. These villages, located to the north of our camps, comprise approximately 5000 people, and are represented by the Okavango Community Trust (OCT), a trust that administers the Duba and Vumbura concessions, oversees the project and directs the flow of funds. Since its inception, the communities have benefited from substantial cash and auxiliary returns, jobs, skills transfer and training in nurturing this area, and in turn are doing a superb job of managing the concessions. The five villages involved in this joint venture are Seronga, Gunitsoga, Eretsha, Betsha, and Gudigwa. 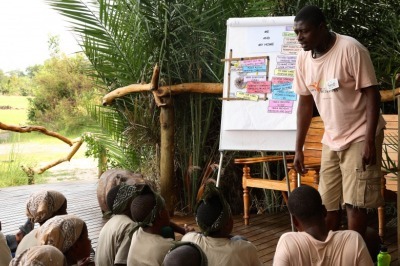 Wilderness Safaris and the Okavango Community Trust have formed a partnership that involves the employment and training of the local community members in all aspects of lodge employment. At this stage Wilderness employs 120 community members in its camps, and those with the greatest potential are selected for the Wilderness Safaris Localization Training Course, a programme designed to train local Batswana to become skilled and effective camp managers. Wilderness is also in the process of assisting and advising the community on administration matters and business planning decisions. This is geared to helping with other small business projects such as vegetable gardens, shops and basket making, which will further enhance the self-realization and self-employment prospects of the members of this community. Wilderness has also employed the services of a qualified paramedic and HIV/AIDS counselor to assist with the health and safety issues that face these communities. The wildlife in this area has benefited substantially from this partnership; with the neighboring communities gaining hard cash, training and employment, poaching has dropped, with the result that animal populations have increased. Accommodation Rates:- From $1,200 per person per night sharing. Please contact us for a quote and suggested itinerary.